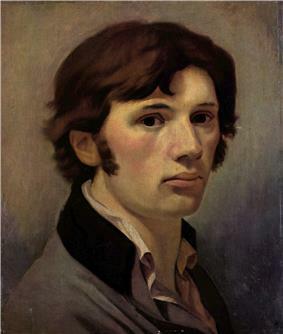 Philipp Otto Runge (German: ; 23 July 1777 – 2 December 1810) was a Romantic German painter and draughtsman. He made a late start to his career and died young, nonetheless he is considered among the best German Romantic painters. Runge was born as the 9th of 11 children in Wolgast, Western Pomerania, then under Swedish rule, in a family of shipbuilders with ties to the Prussian nobility of Sypniewski / von Runge family. As a sickly child he often missed school and at an early age learned the art of scissor-cut silhouettes from his mother, practised by him throughout his life. In 1795 he began a commercial apprenticeship at his older brother Daniel's firm in Hamburg. In 1799 Daniel supported Runge financially to begin study of painting under Jens Juel at the Copenhagen Academy. In 1801 he moved to Dresden to continue his studies, where he met Caspar David Friedrich, Ludwig Tieck, and his future wife Pauline Bassenge. He also began extensive study of the writings of the 17th century mystic Jakob Boehme. In 1803, on a visit to Weimar, Runge unexpectedly met Johann Wolfgang von Goethe and the two formed a friendship based on their common interests in color and art. In 1804 he married and moved with his wife to Hamburg. Due to imminent war dangers (Napoleonic siege of Hamburg) they relocated in 1805 to his parental home in Wolgast where they remained until 1807. In 1805 Runge's correspondence with Goethe on the subject of his artistic work and color became more intensive. Returning to Hamburg in 1807, he and his brother Daniel formed a new company in which he remained active until the end of his life. In the same year he developed the concept of the color sphere. In 1808 he intensified his work on color, including making disk color mixture experiments. He also published written versions of two local folk fairy tales The fisherman and his wife and The almond tree, later included among the tales of the brothers Grimm. 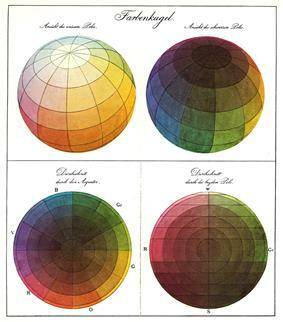 In 1809 Runge completed work on the manuscript of Farben-Kugel (Color sphere), published in 1810 in Hamburg. In the same year, ill with tuberculosis,Runge painted another self-portrait as well as portraits of his family and brother Daniel. The last of his four children was born on the day after Runge's death. 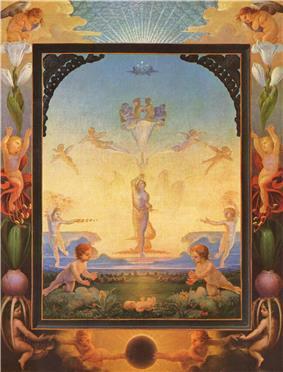 Runge was of a mystical, deeply Christian turn of mind, and in his artistic work he tried to express notions of the harmony of the universe through symbolism of colour, form, and numbers. He considered blue, yellow, and red to be symbolic of the Christian trinity and equated blue with God and the night, red with morning, evening, and Jesus, and yellow with the Holy Spirit (Runge 1841, I, p. 17). He also wrote poetry and to this end he planned a series of four paintings called The Times of the Day, designed to be seen in a special building and viewed to the accompaniment of music and poetry. This concept was common to romantic artists, who tried to achieve a "total art", or a fusion between all forms of art. In 1803 Runge had large-format engravings made of the drawings of the Times of the Day series that became commercially successful and a set of which he presented to Goethe. 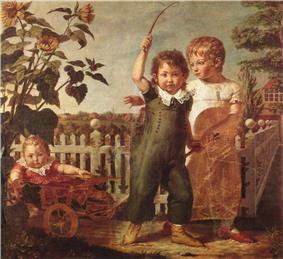 He painted two versions of Morning (Kunsthalle, Hamburg), but the others did not advance beyond drawings. "Morning" was the start of a new type of landscape, one of religion and emotion. Runge was also one of the best German portraitists of his period; several examples are in Hamburg. His style was rigid, sharp, and intense, at times almost naïve. Runge's interest in color was the natural result of his work as a painter and of having an enquiring mind. Among his accepted tenets was that "as is known, there are only three colors, yellow, red, and blue" (letter to Goethe of July 3, 1806). His goal was to establish the complete world of colors resulting from mixture of the three, among themselves and together with white and black. In the same lengthy letter, Runge discussed in some detail his views on color order and included a sketch of a mixture circle, with the three primary colors forming an equilateral triangle and, together with their pair-wise mixtures, a hexagon. He arrived at the concept of the color sphere sometime in 1807, as indicated in his letter to Goethe of November 21 of that year, by expanding the hue circle into a sphere, with white and black forming the two opposing poles. A color mixture solid of a double-triangular pyramid had been proposed by Farbenlehre of 1810 as "successfully concluding this kind of effort." It was soon overshadowed by Michel Eugène Chevreul's hemispherical system of 1839. A spherical color order system was patented in 1900 by Albert Henry Munsell, soon replaced with an irregular form of the solid. ^ Maltzahn, H. 1940, Philipp Otto Runge's Briefwechsel mit Goethe, Weimar: Verlag der Goethe-Gesellschaft. ^ Runge, P. O. 1810, Die Farben-Kugel, oder Construction des Verhaeltnisses aller Farben zueinander, Hamburg: Perthes.